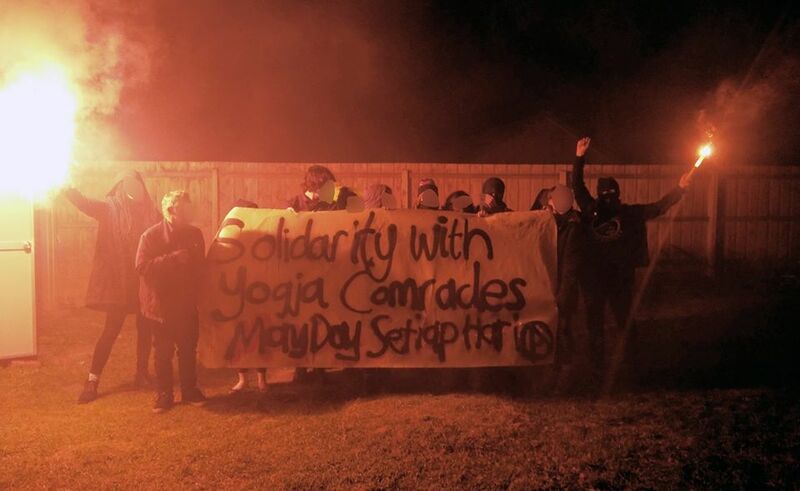 Short statement, fundraiser adress and banner action in solidarity with anarchists in Yogyakarta in Narrm / Melbourne. On May Day in Yogyakarta 69 comrades were arrested. There has since been a huge crackdown involving raids and more arrests based on flimsy evidence. At present there are 11 comrades still locked up in Yogyakarta Police Prison, they are isolated and not allowed any contact with comrades outside. This has only strengthened the resolve of the comrades to keep up the fight against the feudal system ruling Yogja and the Kraton (palace) of the so called sultan.